This is a tribute to the great and valourous Guru Tegh Bahadur Ji, whose supreme sacrifice in order to protect the Sanatana Dharma, can never be forgotten. It was a time when India was ruled by barbarian marauders who had vowed to destroy the Sanatana Dharma forever and to convert its followers to their cult that they were spreading forcefully. People following the Sanatana Dharma (a.k.a. Hindus), particularly Indians, owe him a huge debt of gratitude. 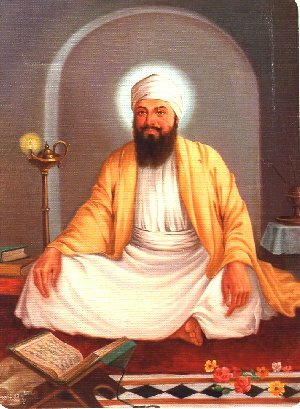 Guru Tegh Bahadur Ji was born on the 1st of April 1621. He is also known as ‘Hind di Chadar’ which means the ‘Shield of India’. But for his brave sacrifice, aurangzeb would have been successful in converting Kashmiri Pandits to his own religion. aurangzeb had issued an order to Iftiqar Khan the Viceroy of Kashmir, to forcefully convert the entire population of Kashmiri Pandits to his own religion. This was because he strongly believed that the mass conversion of Kashmiri Pandits would not only convince but also force the rest of the country to follow suit. aurangzeb could not stand the sight of Sacred Threads or Tilaks on any of his people. The deadline for the mass conversion was fast approaching and a large group of over 500 Kashmiri Pandits let by Pandit Kirpa Ram Datt, left for Anandpur Sahib to seek the help of Guru Tegh Bahadur Ji. Guru Tegh Bahadur Ji asked the Pandits to inform aurangzeb that the Brahmins would gladly accept and embrace his religion if Guru Tegh Bahadur converted first. Guru Tegh Bahadur started preparing to leave on his journey to Delhi which would be his last ever journey on earth. It was farewell time for him and he said the final goodbye to his family members and to his followers. 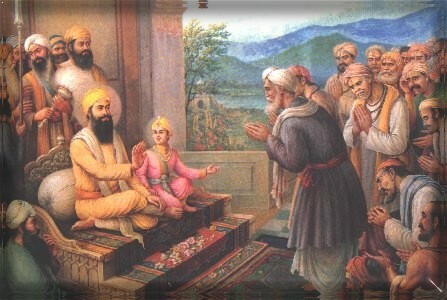 Before he left, he appointed his son Gobind Rai as the next Guru. Those who accompanied the Guru were Bhai Mati Das, Bhai Dyala and Bhai Sati Das and they were fully aware of the danger they were getting into. When aurangzeb came to know of this, he issued orders to immediately arrest Guru Tegh Bahadur Ji. Soon after the Guru and his team had left Anandpur Sahib, they were arrested and taken in chains to Delhi to be produced before aurangzeb. The Guru added, “Every ruler of the world must pass away, but not the Word of God or His Saint. This is how people not only call me a True King but have done so through the two centuries before me in respect of my House and also in respect of others who preceded them and identified themselves not with the temporal and the contingent, but with the eternal and the never dying.” The Guru refused to perform any miracles saying, “Such miracles are the work of charlatans and mountebanks to hoodwink the common man. Men of God submit to the Will of God.” Guru Tegh Bahadur Ji refused to embrace aurangzeb’s religion and said, “For me, there is only one religion and that is the religion of God. Whosoever belongs to it, be it a Hindu or of any other faith, him I own and he owns me. I neither convert others by force, nor submit to force to change my faith.” The infuriated aurangzeb ordered Guru Tegh Bahadur Ji to be forced to convert to his religion through torture or to be killed. Guru Tegh Bahadur Ji had to undergo a excessive torture and he was kept in an iron cage like an animal. He was starved of food. Right before the eyes of the Guru, Bhai Mati Das the devoted Sikh was tied between two pillars and he was sawn into two parts alive. Bhai Dyala was thrown alive into a cauldron of boiling water and was killed. Bhat Sati Das was wrapped in cotton wool and he was set on fire. The Guru took all these cruel acts without flinching and he showed neither signs of anger nor distress. On the fateful day which was the 24th of November 1675, the moment arrived and the brave Guru Tegh Bahadur Ji was placed in public view at a square known as Chandni Chowk. As the Guru prayed, he was beheaded by the executioner of aurangzeb. Sahib. As a public funeral would have been too dangerous for the entire population of Anandpur Sahib, Bhai Lakhi Shah set fire to the Guru’s house thus ‘cremating’ him in the process. At the same time, The Guru’s head was taken to his saddened widow Mata Gujari and young son Guru Gobind Singh. A funeral pyre of Sandalwood was constructed in Anandpur Sahib. The head of Guru Tegh Bahadur Ji was cremated by his young son Guru Gobind Singhji. Never in recorded history, has a leader of one religion ever sacrificed his own life in order to save another religion and to protect its followers. I bow my head in reverence to the great Guru Tegh Bahadur Ji and express my sincere gratefulness to Him and to all the gallant Sikhs who laid down their lives to protect Bharat Mata, her people and her culture. Guru Tegh Bahadur Ji was one of the most important people who made grand sacrifices for saving the Dharma and Bharat from being annihilated by the sinister mughals. There was a road in Delhi named after the mass murderer aurangzeb but there is not a single road named after the Great Hind di Chadar! How many Indians who have been to Chandni Chowk in Delhi know about the public beheading of the Great Guru right there? aurangzeb Road has been renamed as Dr. A.P.J. Abdul Kalam Road which means that India has taken one more step towards ceasing to be the only country among those of civilised people, to name streets and roads after mass murderers and plunderers! Bole so Nihal.. Sat Sri Akaal.